“Village Safari Day Tours”. 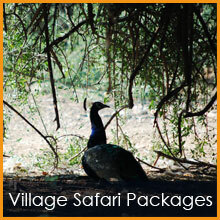 Is a highly recognized Tour Operator in Jodhpur over 5 years of extensive experience in Village Safari business. It was established and officially registered with Association of IATA/FIATA , Reccomended by tripadviser. We have extensive experienced in ecotourism. Because we know how difficult it is to get a good tour in our village safari and you have only few days to visit our city, we want to give you a real amazing adventure in a 4-6 hours tour and of course with the best prices. How do we do this? Easy, we show you real art & craft and wildlife and traditional family. we suggest the best tours accordingly to your preference. We have a great tour keeping you close to the tradition and showing you such as, Country side, art & craft , Wildlife, Village etc…. Also, our Company is insured which will give you a peace of mind! "Difficult to believe? Choose us for a great surprise!" Because what we get from our tour some of money goes to all village family where we visit as well. So we support to local village and local craft. Because We are from local village traditionally we are artist (Durry Weaver’s) so we can give you best and memorable experience in our village safari. So don’t wait and don’t think too much just call us or email us for your confirm safari by open jeep and get best experience in India.